The Intensive English Language Program (IELP) marketplace is rich with opportunity for American colleges and universities. However, the market is shifting and universities need to stay on top of these changes to remain competitive. As mentioned in Building Your Own Market with IELPs, international students are looking to the US as a prime higher education destination but American colleges and universities aren’t doing everything they can to ensure these students enroll. Though this is presently a question of lost opportunity, it will soon evolve into a question of lost market share. In this video, we explore the changes happening across the IELP marketplace. We look at the changing nature of international competition, dig into where international students are (and will be!) coming from, and what they want to study. 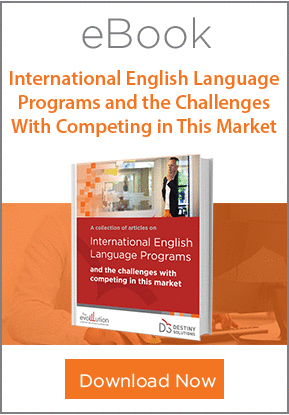 International English Language Programs and the Challenges with Competing in this Market: This eBook from Destiny Solutions and The EvoLLLution shares insights into what it takes to succeed in the competitive IELP space and shares common roadblocks that institutional leaders must understand and overcome in the development and management of these programs. New Routes to Higher Education: The Global Rise of Foundation Programmes: This research paper provides an overview of the state of the global IELP marketplace today, focusing mainly on formal pathway programs. It identifies markets for growth and shares insights on the preferences of students. One Size Does Not Fit All: Assessing International ESL Program Providers: This EvoLLLution article by Loyola University Chicago’s Beth Lair digs into the array of language learning opportunities on the market for international students and discusses how institutions need to be able to position themselves to meet the needs of unique groups rather than trying to serve the whole world. IELP providers must tailor everything—their offerings, their service, even their marketing collateral—to specific groups of prospective students. As such, it’s critical that IELP leaders understand how the industry is transforming.